SAW011555 SCOTLAND (1947). Holy Island, general view, showing Inner Lighthouse and Mullach Mor. An oblique aerial photograph taken facing north. 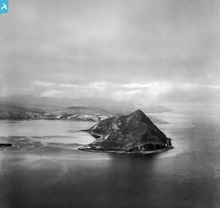 Title [SAW011555] Holy Island, general view, showing Inner Lighthouse and Mullach Mor. An oblique aerial photograph taken facing north. 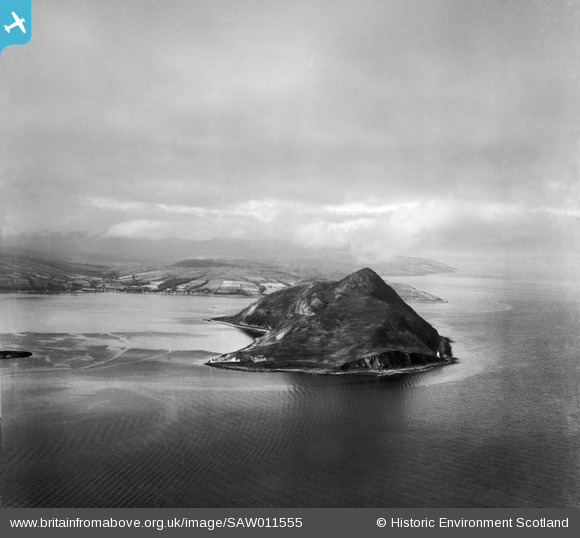 Lamlash Bay - WWII Naval Anchorage & where "Lilypad" - a floating airstrip was tested. Lighthouse Keepers Garden - for Vegatables,etc. Inner Lighthouse known as "Wee Donald"
There is a perfect tranquility about this shot and a real sense of atmosphere with a good cloud scape. The light picking out the settlements on the island evokes the idea of a destination to a magical place and the island form itself is neatly framed. Here's a recent photo of the "Inner Lighthouse" on Holy Isle the Lightkeepers Houses are now a Buddhist retreat - you can see a Monk "contemplating" at the foot of the lighthouse!! Is there a lighthouse on Holy Island? Holy Island with Arran in the background.